UFW Stories: "Is It OK to Eat Grapes Yet?" "Is It OK to Eat Grapes Yet?" Many years ago, in 1971, late one evening as my friends and I drove into a Safeway parking lot near San Francisco’s Haight-Ashbury District, we approached a couple of people who had an eye-opening message for us. There was a grape boycott going on. They asked us to turn away from Safeway and to support the grape boycott the farm workers had organized. We pulled out of that lot into the night and went in search of our munchies somewhere else. Without being very politically astute, somewhere within we understood something more important than financial maneuvers were at stake. Many, many years later, I had the opportunity to ride the bus with AFTRA members to Watsonville to protest grocery chains that didn’t buy union strawberries. This time there were far more than the two night sentries I had met in San Francisco. In fact, there were so many people, the front of the line headed out of a stadium, marched through the town of Watsonville, and was returning into the stadium as people were still leaving it! As we marched through downtown Watsonville, members of Culture Club on top of a building unfurled a humongous red and black UFW banner that covered the top half of that brick building to cheers from the street. Marching with labor leaders at the front of the line was the head of Ralphs, the one chain at that time buying union strawberries. I don’t know if that was the same individual who, not long after that, was so grotesquely cruel to Ralphs’ employees during the infamous strike/lockout. 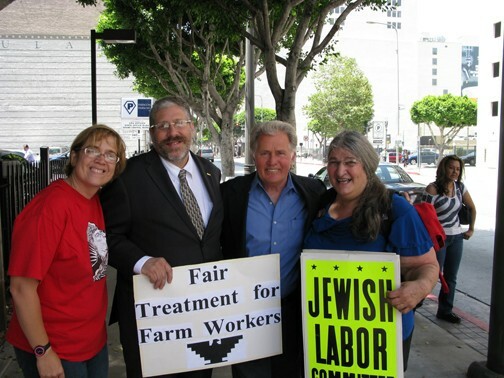 Recently, having the privilege of being Executive Director of the Jewish Labor Committee Western Region, I also had the privilege of being involved with the UFW’s campaign against deaths in the fields - workers who have been overexposed to intense heat, lack of water and shade, and not given proper breaks were at the same time being forced to meet higher picking quotas. A large group of us marched into Trader Joe’s headquarters in Monrovia and presented thousands of letters from the people protesting TJ’s purchasing of wine made from grapes picked by laborers whose employers kept them at high risk in the fields. The Executive at TJ’s couldn’t be found. After listening politely, a small group of staff chased us out into the sunshine and away from the front door to avoid menacing people who might want to enter the facility. If anyone has ever been to the small, rather isolated Monrovia headquarters, you know how preposterous that was. Later in the year, a series of vigils was held, during the day and in the evenings, for those workers who had died on the job. Their deaths were horrific. When our bodies become dehydrated in intense heat, we succumb to heat stroke. Our last moments, if at all conscious, are disoriented. It is not a peaceful passing. Everything is stolen from us. Most sadly, these deaths could have been avoided if the employers had heeded and obeyed the law in the fields that demands workers be afforded fresh water, proper shade and rest breaks, and respect for their basic needs. Fifty years later, after the loss of great leaders and the continued bravery of Dolores Huerta in speaking out and educating the general masses about the importance of respect for workers in the fields, after decades of migratory pattens have been studied and written about, after generations of children who picked in the fields grew up to attend law school and medical school and now help those still toiling with their backs bent and their brows furrowed, I still don’t bring grapes to union functions. And I wonder, will we have to boycott everything that grows in the fields all at once until workers’ are allowed to straighten their backs at will. In this new Century, another problem has come to light - that of farm workers being brought into America as commodities - victims of human trafficking, unable to choose whether they migrate with the crops or are herded into trucks and sold again as another Strange Fruit. Parallel to this travesty against humanity and people of color, anti-immigration laws throughout farming states are forcing farm workers to flee places like Georgia, where it is becoming apparent that most people born in America will not stoop for low to no wages in the fields. Crops are rotting while fear is growing. Yet the Farm Workers stand United. Their story is not over. The richness of the United Farm Workers is their solidarity. Through it they have banked a history that will supply the movement with coming successes. I am proud and happy to be able to share tears and smiles with such dear friends. Congratulations on 50 years!